I don't want this post to be purely self-congratulatory, but I do have some good news to share. I think it's relevant and useful news for litigators and litigation professionals. A2L was just voted number one in the legal industry again. 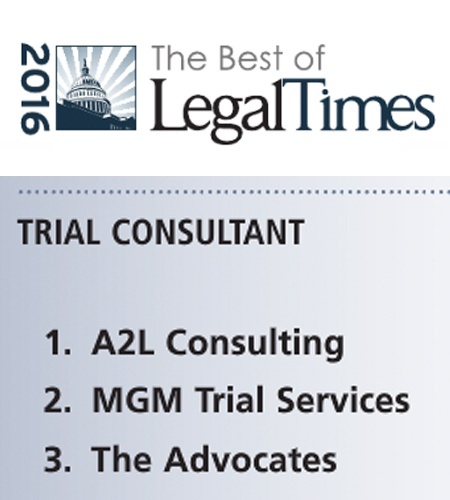 This time, it's in the category of trial consultants, in a poll conducted by the prestigious Legal Times newspaper. This accolade comes on the heels of being voted the number one jury consultant and number one litigation graphics provider in a variety of other national polls. Here's why I think this information is helpful for our readers. Twenty years after founding A2L, when I look at our industry I see three or four firms capable of delivering truly top-class results in high-profile litigation. However, the view from the law firms seems entirely different. If you Google any of our services like jury consulting, litigation graphics, or trial technician providers, we may very well come up first in many of these searches (for good reason), but there will be dozens if not hundreds of other providers listed for these services. How is one expected to sort the wheat from the chaff? You can't tell from a Google search because it's obviously not a reliable indicator of who is a top services provider. You can't always tell from your colleagues either. Have they had have many excellent experiences with a provider, or just a one off -- or do they have a longstanding relationship with a provider without a reliable track record? Well, it's exactly surveys like this one in Legal Times that provide an objective source from thousands of lawyers surveyed. And I'm proud to say that over the last five years, A2L has been consistently highly ranked in just about everywhere we've been nominated. So if you're in the market for a litigation consulting firm like ours or if you're in the market for another service like discovery, court reporting, or even law firm and litigation financing, a guide like this one is a good source of information. These guides prepared by objective organizations like Legal Times provide a directory of high-quality providers and can save a stressed litigator or litigation paralegal considerable time identifying the very best jury consultants, the very best litigation graphics providers, the very best trial technicians, the very best trial consultants or any one of dozens of categories relevant to litigation. Click here to download your copy of this 2016 guidebook. I hope it's helpful to you.